The New Westminster Salmonbelllies took over top spot in the Western Lacrosse Association on Friday after a 17-16 win over the Burnaby Lakers at Bill Copeland Sports Centre. The Salmonbellies outscored the Lakers 2-1 in the overtime period, forced after Joel Matthews tied the game at 15 with 1:12 left to play. Austin Jerhoff scored the winning goal at 4:20 of overtime. Eli McLaughlin scored with an extra attacker to get the Lakers back within a goal, but a late penalty killed any hope of re-tying the game. The Lakers kept pace with the ‘Bellies throughout the game, trailing 6-4 after the first and 12-10 after the second. The ‘Bellies chased Zak Boychuk after 10 goals, and led 11-6 halfway through the game after a five-goal run. But the Lakers mounted a four-goal run of their own to get within a goal. Tony Malcom’s second goal of the game put the ‘Bellies back up by two after two. Logan Schuss scored on the power play 45 seconds into the third period. Burnaby didn’t reply until the 8:06 mark on Coady Adamson’s second goal. From there, the Lakers outscored the ‘Bellies 4-2. Malcom’s four goals led the Salmonbellies, who also had big games from Logan Schuss (2G/6A) and Mitch Jones (2G/5A). Jason Jones and Jerhoff scored two each. Tye Belanger made 19 saves before being lifted in favour of Alex Buque, who made 24 saves for the win. McLaughlin’s eight points (3G/5A) led the Lakers. Athan Ianucci added a hat trick and two helpers while Matthews and Dane Stevens each recorded two goals and four assists. Adamson had a hat trick and Adam Perroni added two goals. Eric Penney took the loss. New Westminster leads the WLA with 18 points. The Maple Ridge Burrards are in second place with 15 points and the Victoria Shamrocks in third place with 14 points after a 13-11 win over the Langley Thunder on Friday. Should the top three remain as they are, Langley, Burnaby and the Nanaimo Timbermen will fight for the WLA’s fourth and final playoff spot. 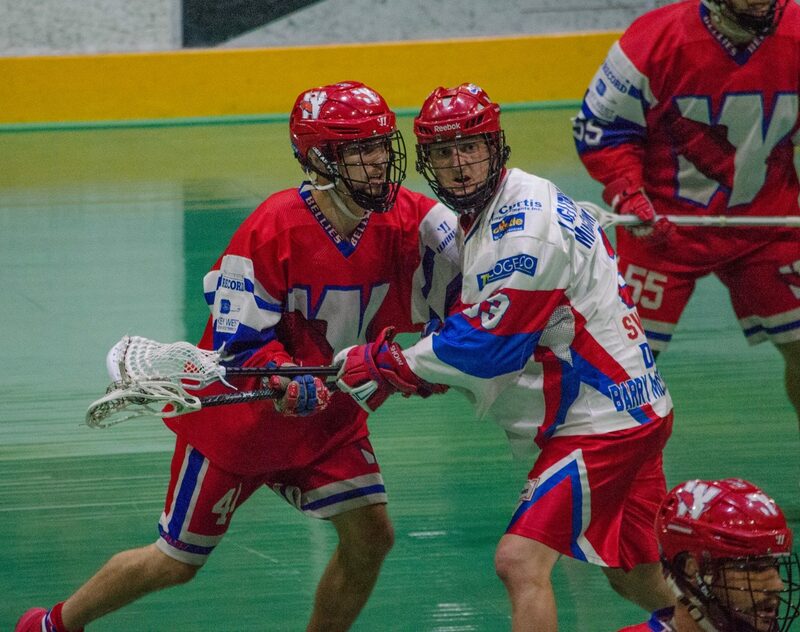 The Salmonbellies visit Nanaimo on Sunday while the Lakers play their second of a three-game home stand on Tuesday versus the last place Coquitlam Adanacs.